Groupe Crête Inc.’s Saint-Faustin-Lac-Carré mill was the first stop. The mill is one of two Quebec plants owned by the company — the other location is in Chertsey. Saint-Faustin-Lac-Carré only produces softwood — mainly spruce and fir, with a small amount of jack pine (about five per cent). The mix is usually split in half but has been 65 per cent spruce and 35 per cent fir this year, Alain Gagnon, Groupe Crête’s director of sales explained. This plant been at this location since 2000, but the Crête family bought it in 2011. The family traces its company roots back to 1949. The mill produces 150 million board feet of softwood a year that is FSC-certified on-demand. Its main customers are in Quebec, Ontario and the U.S., however 60 per cent of its products are sold in Quebec. 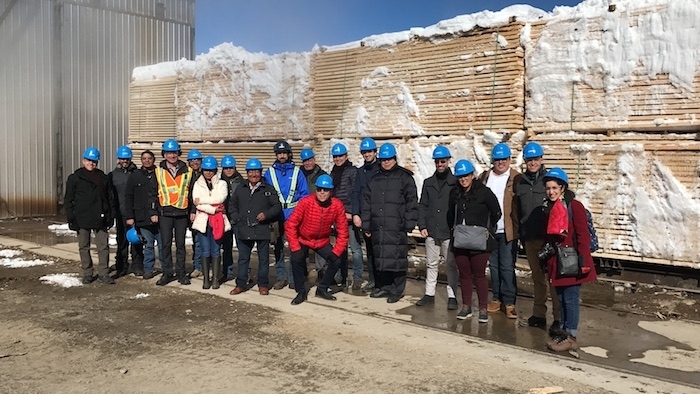 In addition to lumber, the mill produces byproducts such as wood chips, which are then sold to pulp and paper mills — 45 per cent of the log volume is sent to pulp and paper mills. The mill has two debarkers, which go through 35 logs a minute. The scanning is done in the sawmill, while the grading is done at the planer mill on site. Trimming is done to cut the maximum length possible for each piece, thereby optimizing the length on each one. In the lug loader, the speed is 115 lugs a minute. Pieces that are too short go to the chipper and get sold to the aforementioned pulp and paper mills. The bark at Saint-Faustin-Lac-Carré is burned to produce energy for the kiln and to heat the plant. About 50 per cent of the facility’s bark is used for energy production, including ash, and four tonnes of bark is burned per hour here. The plant also has five batch kilns, four of which are Wellons and one of which is Cathilde. Spruce takes approximately 35–45 hours to dry, depending on the season (summer to winter), while fir takes about 90–110 hours to dry in the same seasonal range due to its high water content. Once the lumber is in the planer mill, the machine separates it by quality. Each piece is graded into seven grades. Then the lumber goes to the sorting bins where 140 pieces are graded per minute. That equals approximately 50,000 pieces a day. Pieces are cut according to the market price for each grade, Gagnon explained, but six feet is the shortest length here. The system is manufactured to produce North American lengths. To get a peek at the second mill tour of the day, click here.